Resources available here are offered to support instructional practice and to encourage educators to take steps toward adopting technology that will make classroom instruction more authentic, engaging, and applicable than ever before. 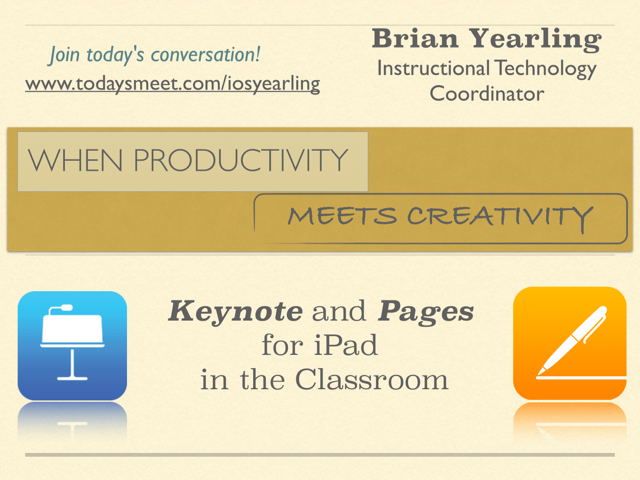 If you wish to connect with Brian Yearling to deliver these professional learning workshops in your educational environment (or other workshops customized to your unique environment and needs), please click the Contact tab above. When we consider the touch pad interface of the iPad, and the elegant user interface that Apple includes in ALL of their software, we may want to think about re-incorporating productivity software that makes use of the iPad to make beautiful, hands-on presentations, brochures, letters, resumes, and learning modules. This presentation focuses on ways to use these products creatively to think outside the standard of productivity software, and how to put the iPad touch interface and camera to use in these projects. Bring your understanding of productivity software along with you and quickly progress up the SAMR ladder from basic substitution (you already know how to do this anyhow...you've used this type of software before) to Augmentation and possibly even Modification!